The book collectors are real connoisseurs who have gathered their collections with love for decades. Genuine collectors always care about correctly organizing their collection and will not keep it piled up in a disorderly fashion. Everything should be stored with accuracy to give you the opportunity to find the needed item immediately. The paper filing method is a relic of the past, so we need some new solutions to replace it. In the digital age, smarter ways of sorting are necessary. Therefore the idea of LignUp book collector has emerged. We have developed an effective program that will help you to catalog your collection on your PC or Mac. How can one catalog a large collection of books and still have the ability to find the necessary item immediately? With our book collector this will not be a problem. Actually, LignUp book collecting software is a set of tools, and each of them serves one goal – to make the lives of book collectors easier. What makes our software so special? Let us first look at the programs you may have used in the past. In order to avoid confusion the main parameters have always been introduced to the database, and the search was made in accordance with the features entered. Though it contributes to the organization of your collection, still this is not the best solution. The person who has a huge collection will literally become its slave, entering new entries endlessly! There are many solutions on the market which are based on the same principle. We have found the best way! 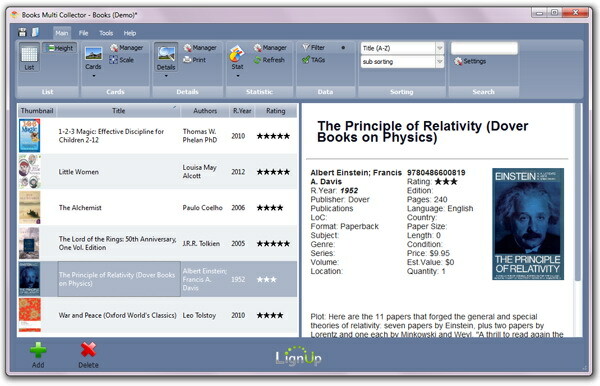 LignUp Books Multi Collector works differently, and this method lets you not spend so much time on the organization issue. 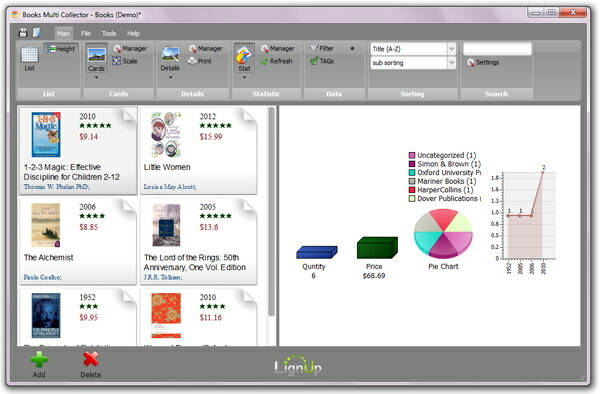 LignUp book organizing software uses a different approach and scans the barcode of the book. Barcode may seem to be a useless thing at first sight, but do not be rash with your decision. It hides a lot of useful information for us that will let us define the product, and refer it to a particular section. Why spend time on entering data that are already available for you? All you need is just to find the right means to read this data. Make use of book collecting software, and it will introduce important parameters automatically. While others practice manual input, performing monotonous and boring work, you can just enjoy your hobby, and spend valuable time on more important matters. You will not have to scan the covers of the books either, as all of this can be found by our great tool. It will enter such things as title, author, and the description of the book too. Our book collection software with the data entering automatic feature will save a lot of your valuable time! Download the demo-version, evaluate it and look at the ergonomic interface with your own eyes! Full version of the Book Collector concentrates the whole power of this especial software.